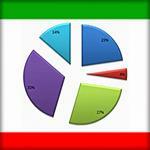 According to the Persian language site sazegara.net, the following 5-question survey was conducted in secret in Iran, and about 350 Iranians from Tehran and 3 other unnamed provinces took the survey on Jan. 17th 2010. Here is your chance to take the same survey but in English. You ‘ll see the result for both surveys. The original survey plan was for 200 males and 200 females to be interviewed, and the final results are for 162 males and 185 females. (53 people declined to be interviewed) The age group was from 20 to 49. We estimate that Payvand’s female to male visitors are about %45 female to %55 male, and since last election in Iran, the age range greatly widened from 20’s to 70’s. The sorting order of poll answers for each question is the same for Persian and English (the sorting order of poll results may be different). It may take up to 30 min. for polls to update.